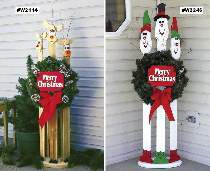 Inexpensive fence pickets can be used to make this trio of reindeer or snowmen. Picket projects hold standard 24" real or artificial wreaths. Tallest reindeer is 61"H. Tallest Snowman is 66"H. All patterns drawn FULL SIZE. #1083 Hardware Package includes a three-socket wiring harness, three red bulbs, six plastic eyes, flushmount connector and Merry Christmas decal. Project plan, wood and wood finish are not included. Specials include either the #W2114 Plan or the #W2246 Plan and one #1083 Hardware Package.